Download, Save and Open images from your digital SLR camera on your PC as you take them, with Photodrop. 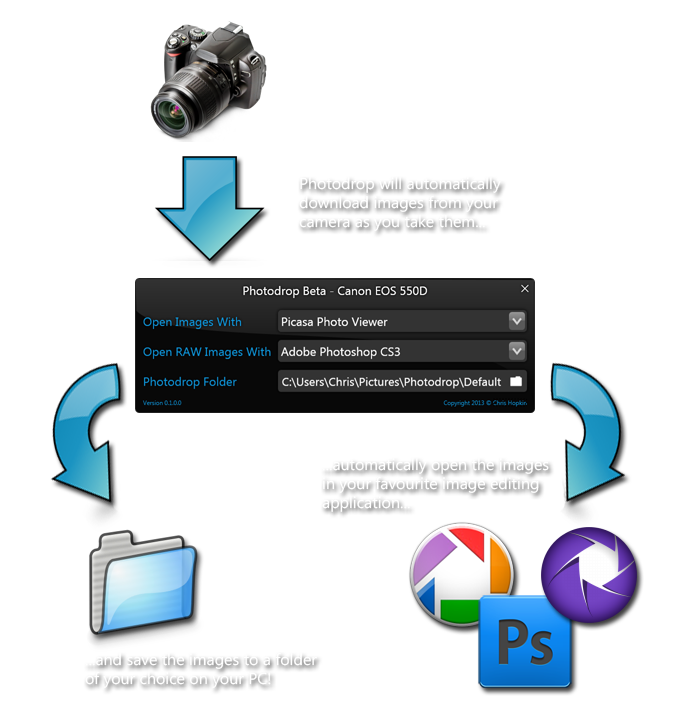 Simply connect your digital SLR camera to your PC via USB, choose your Photodrop folder and target applications for opening JPEG and RAW images, then away you go! I am currently looking for volunteers to help test Photodrop before its official release. If you would like to help, and you have access to any of the supported cameras listed above, click the button below and then proceed to the Checkout to download the Photodrop Beta setup (there is no charge and you won’t be asked for any payment details). This will install a fully functional, but time limited version of Photodrop. If you have any questions or feedback, please get in touch via the Contact page.